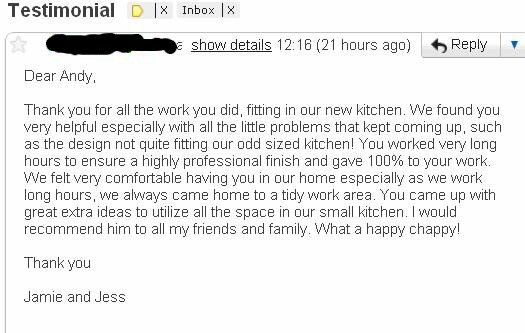 A Thank You from Westley, who had his IKea Wardrobes and other furniture picked up from Lakeside IKEA , delivered , assembled and custom fitted to the walls . "Throughout the 8 weeks AK Construction was with us they were friendly courteous ,Considerate,Professional and totally committed to the project . We would be delighted to work with them again"
Google Testimonials to add please click here Testimonial on Google and scroll down to reviews , you may need a google email account . Thanks.